Like a decentralized Wayback Machine, a new tool called Amber is letting individual websites join the fight against link rot. With Amber, web publishers can automatically create a mirror of every page they link to from their own site. That mirror gets stored on the publisher's own server, so even if an external link goes down, visitors to the publisher's site can still view a cached version. For instance, let's say a Microsoft employee posts an embarrassing rant on the company's blog, and Microsoft pulls the post after it's discovered by the tech press. 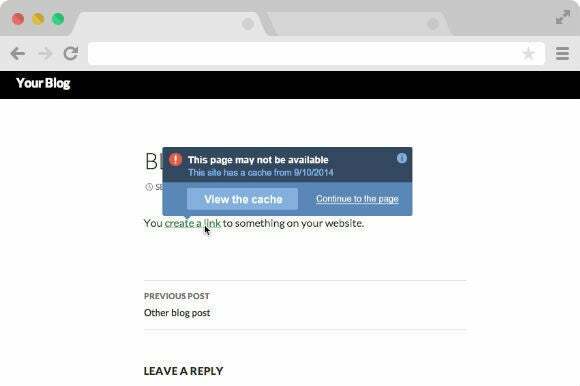 This would normally result in a dead link, but with Amber, tech sites can store their own cached version of the offending post, allowing users to see the content even after the link goes down. Aside from just making permanent records of corporate humiliation, Amber says the tool can help fight censorship, dampen the effects of DDOS attacks, and combat the run-of-the-mill link rot from redesigned or retired websites. News outlets, human rights groups, wikis, bloggers and political activists are among the primary use candidates, and Amber is already compatible with sites that use Wordpress, Drupal, Apache, and Nginx. For now, however, Amber is in closed beta. Interested publishers can sign up by e-mail or hop on the announcement list for the public launch. The tool is being offered by researchers at Harvard University's Berkman Center for Internet & Society. Why this matters: While caching services already exist from Google, the Internet Archive's Wayback Machine, and Perma.cc, using those sites to retrieve a broken link can be a hassle. And because those services are centralized, there's a chance they could become temporarily or permanently unavailable. If Amber takes off and works as planned, it'll distribute the caching work across many individual sites, while ensuring that visitors can always see what's being linked to.